According to a NY Times piece today, “A top Central Intelligence Agency official [identified as Stephen Kappes, the agency’s deputy director] traveled secretly to Islamabad this month to confront Pakistan’s most senior officials with new information about ties between the country’s powerful spy service and militants operating in Pakistan’s tribal areas, according to American military and intelligence officials.” The CIA official reportedly presented evidence that showed that members of Pakistan’s Inter-Services Intelligence (ISI) “had deepened their ties with some militant groups,” specifically the Haqqani Network [see right image of Maulavi Jalauddin Haqqani, and, for more information on the Haqqani Network, read this piece from the Jamestown Foundation] that were connected to the surge of violence in Afghanistan, including the suicide bombing this month of the Indian Embassy in Kabul. Washington should seek to redefine relations with Pakistan, which evolved ad hoc after 9/11. Detailing how we expect Islamabad to help realize mutually agreeable aims is a necessary step toward a more collaborative and sustainable relationship. Putting American troops on Pakistani soil would negate any potential benefits of the Biden-Lugar legislation, [referring to the legislation to triple U.S. nomilitary aid to Pakistan]. Essentially, he added, “An assertive, unilateral U.S. military strategy is more likely to compound our problems than to solve them.” Given the anti-U.S. sentiment already evident in the region, such a statement is likely to ring true. Terming it a part of deal with America, he noted that after the suicide attack on Indian Embassy in Afghanistan, the Indian government had stated that it would break the ISI and now it had succeeded in breaking such an institution that had been a defending line of Pakistan’s other institutions. Terming it a fundamentally flawed decision on all counts, political, administrative and national security, he said that it was ironic that the PPP-led government has no faith in its own intelligence and investigative organizations but is seeking to politicize a national institution like the ISI. It will be interesting to see how much attention will be paid to this situation in the coming week, as Gilani meets with U.S. President Bush in Washington, D.C. and issues related to Pakistan’s administration over the FATA will likely be on the table. A friend passed on a YouTube clip of Pakistan’s rising female pop duo, Zeb & Haniya, or Zeb Bangash and Haniya Aslam. The cousins released their debut album, entitled Chup, on July 19th nationwide. The music video for the song, Aitebar, meaning ‘Trust’ in Urdu, also began airing this past Saturday, [see clip below]. Pakistan has not lacked women singers, but Zeb and Haniya are the first vocalists to be writing their own songs and composing their own music. For Chup, Haniya also plays the rhythm guitar. They describe their music as a fusion of American folk, swing, jazz and blues, Bollywood, along with influences from Turkish and Lebanese music and the homegrown qawwali and ghazal, quite unlike what Pakistan has heard so far. Much of my pondering came to head yesterday when I saw an amusing clip on CNN’s Situation Room, entitled, “Pronouncing Pakistan.” The news agency explored the different pronunciations of our country by U.S. presidential candidates, Sen. John McCain and Sen. Barack Obama. Much like the photo posted above, McCain says Paackistan (note the long ‘A’ sound emanating from his facial expression), while Sen. Obama, labeled by his critics as a “multi-culti fruitcake,” uses the more ‘ah’ sound, when pronouncing the word. Click here to see the clip. The Egyptian commander spoke Arabic during the interview, which was dubbed in Urdu for Geo’s Pakistani audience. During the televised appearance, al-Yazeed, who is also known as Shaikh Saeed, further discussed the Danish embassy bombing, asserting, “We had chosen a time for the attack when there would be no innocent Muslims around.” It should be noted that all eight people killed in the June 2 attack were reportedly Muslims. Reuters, in its coverage of the interview, noted, “Al Qaeda justifies killing fellow Muslims by deeming them to have become heretics, excommunicated from the Islamic community because of their loss of faith,” or, in this case, because they worked for a Western embassy. The rare interview, dubbed in Urdu, was obviously meant to target Pakistanis sympathetic to the Al Qaeda cause. The AQ commander called for more Pakistanis to fight in Afghanistan, noting, “In fact it is obligatory for them to render this help and is a responsibility that is imposed by religion. It is not only obligatory for residents of the tribal regions but all of Pakistan.” Sheikh Saeed is known to hold AQ’s No. 3 position. 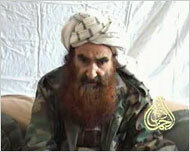 MSNBC reported, “The U.S. has long targeted al-Qaida’s third-highest-ranking officials, because they believe the men who occupy that position are the chief operational officers of the terrorist group.” BBC noted, “Mustafa Abu al-Yazeed is understood to be the operational commander of al-Qaeda in Afghanistan – a position which the Western intelligence community has long viewed as pivotal to the planning and execution of militant attacks around the world.” Since 2001, five occupants of the organization’s number three spot have been killed or captured. This is not the first time that such protests have occurred. In April 2007, thousands of Pakistanis staged rallies in the country’s major cities of Islamabad, Karachi, Lahore and Peshawar to condemn extremism and the exploitation of Islam. According to the Daily Times, the protests, particularly in Lahore, marked “the first time a large crowd has rallied against religious extremism…” The news agency added, “The protesters – including civil society and human rights activists, minority groups, political workers, lawyers, trade unions, journalists and students – gathered at the Lahore High Court building” and began marching towards the Punjab Assembly. Although the Pakistani government has publicly denounced extremism and has indicated their resolve in solving the militancy problem, efforts by members of the country’s civil society and media to counter this threat are arguably more significant. The fight against religious militancy, a force that perpetrates acts of violence and intimidation against innocent Pakistanis, cannot only be tackled through a top-down approach. Instead, support for these hardline elements must be marginalized by Pakistan’s people, particularly by those civil society representatives and journalists who have effected change in the country. These people are not only legitimate actors in Pakistani society, but they possess the voice and the medium necessary to foster support for the government and military’s policies in the NWFP and tribal areas. Despite what many think, this is not the United States’ war. This is not the military’s war. It is also not the government’s war. This is our battle against extremism, against those who have hijacked our religion to justify violence, and against those who preach intolerance and hatred in order to legitimize their actions.